[164 Pages Report] The European medical equipment maintenance market is expected to reach USD 8.93 Billion by 2022 from USD 6.29 in 2016, at a CAGR of 6.1% during the forecast period. The base year considered for the study is 2016 and the forecast period is from 2017 to 2022. The study estimates the European medical equipment maintenance market size for 2017 and projects its demand till 2022. In the primary research process, various sources from both demand side and supply side were interviewed to obtain qualitative and quantitative information of the report. Primary Sources from the demand side include various industry CEOs, vice presidents, marketing directors, technology and innovation directors, and related key executives from the various original equipment manufacturers (OEMs) and independent service organizations (ISOs) in the medical equipment maintenance and services market. Primary sources from the demand include hospital purchase managers, radiologists, and physicians from reputed hospitals. For market estimation process both top-down and bottom-up approaches were used to estimate and validate the market size of the European medical equipment maintenance market as well as to estimate the market size of various other dependent submarkets. All possible parameters that affect the market covered in this research study have been accounted for, viewed in extensive detail, verified through primary research, and analyzed to get the final quantitative and qualitative data. This data is consolidated and added with detailed inputs and analysis from MarketsandMarkets and presented in this report. The medical equipment maintenance market is highly competitive with the presence of both OEMs and ISOs. GE Healthcare (U.S.), Koninklijke Philips N.V. (Netherlands), Siemens Healthineers (Germany), Toshiba Medical Systems Europe (Germany), and Drägerwerk AG & Co. KGaA (Germany) are some of the leading OEMs; whereas, TBS Group S.p.A. (Italy), Alliance Medical Group (U.K.), Pantheon Group (Italy), Technologie Sanitarie S.p.A. (Italy), Avensys UK Ltd. (U.K.), and Grupo Empresarial Electromédico (Spain) are some of the leading ISOs operating in the European medical equipment maintenance market. This report categorizes the European medical equipment maintenance market into following segments and subsegments. Note: 1. Advanced imaging modalities include computed tomography (CT), positron emission tomography-computed tomography (PET-CT), magnetic resonance imaging (MRI), gamma cameras, and angiography systems and Primary imaging modalities include general X-ray, digital X-ray, C-arms, mammography systems, and ultrasound systems. 2. **other devices include defibrillators, ECG machines, infusion pumps, pulse oximeter, and patient monitors. The European medical equipment maintenance market is expected to reach USD 8.93 Billion by 2022 from USD 6.64 Billion in 2017, at a CAGR of 6.1% during the forecast period. A number of factors, such as rising focus on preventive medical equipment maintenance, adoption of innovative funding mechanism, growth in associated equipment markets and growing purchase of refurbished medical equipment are expected to drive the growth of the market. On the other hand, high initial cost and significant maintenance expenditure are expected to restrain the growth of this market in the coming years. This report segments the European medical equipment maintenance market into device type, service type, service providers, contract type, end user and regions. 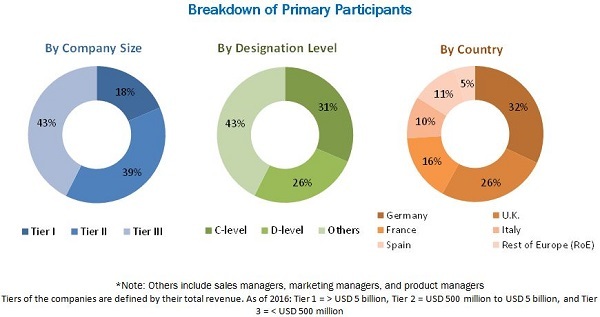 On the basis of device type, the European medical equipment maintenance market is segmented into imaging equipment, endoscopic devices, surgical instruments, and electromedical equipment. In 2017, the imaging equipment segment is expected to account for the largest share of the European medical equipment maintenance market. This segment is also expected to grow at the highest CAGR during the forecast period. The growth of this segment is attributed to the high replacement cost of imaging equipment and the need for ensuring maximum equipment uptime. The European medical equipment maintenance market, by service type is segmented into corrective, preventive, and operational maintenance. In 2017, preventive maintenance is expected to account for the largest share of the market. Technological advancements in medical devices and the consequent need for their preventive maintenance are expected to fuel market growth in this segment. Based on the service provider, the European medical equipment maintenance market is segmented into original equipment manufacturers (OEMs), independent service organizations (ISOs), and in-house maintenance. In 2017, OEMs are expected to account for the largest share of the market. The large share of the OEMs segment can primarily be attributed to the wide geographic presence and strong technical expertise of OEMs. On the basis of contract type, the European medical equipment maintenance market is categorized into annual and multi-year maintenance contracts. In 2017, the multi-year maintenance contracts segment is expected to account the largest share of the market. Hospitals with large budgets prefer long-term contracts to match the lifecycle of medical equipment and to avoid renegotiating of service contracts. Moreover, service providers are likely to provide some discount on the final amount for multiple-year contracts thus; multi-year contracts can offer potential cost benefits to providers. By end user, the European medical equipment maintenance market is segmented into public-sector organizations and private-sector organizations. In 2017, the public-sector organizations’ segment is expected to account for the largest share European medical equipment maintenance market. The dominance of public healthcare in most of the European economies, as well as the increase in value-based procurement of medical equipment are the major factors driving the growth of this end-user segment. 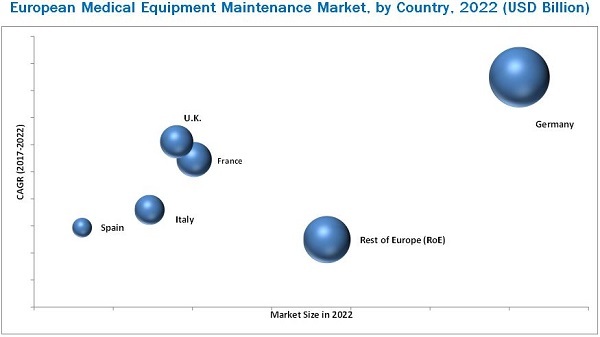 The European medical equipment maintenance market is highly competitive with the presence of both OEMs and ISOs. GE Healthcare (U.S.), Koninklijke Philips N.V. (Netherlands), Siemens Healthineers (Germany), Toshiba Medical Systems Europe (Germany), and Drägerwerk AG & Co. KGaA (Germany) are some of the leading OEMs; whereas, TBS Group S.p.A. (Italy), Pantheon Group (Italy), Technologie Sanitarie S.p.A. (Italy), Avensys UK Ltd. (U.K.), and Grupo Empresarial Electromédico (Spain) are some of the leading ISOs operating in the European medical equipment maintenance market. Despite the positive outlook for the market growth in the Europe, budgetary constraints pose a significant challenge for the market growth in coming years.